Downtown Yellowknife is a tangle of contradictions packed into little more than 10 blocks by four. There are beautiful parks and abandoned lots, thriving restaurants and shopping malls that appear to have barely survived the apocalypse. It’s not what you’d call a healthy downtown — storefront after storefront stands empty, and homelessness and substance abuse are highly visible. But it’s still Yellowknife’s hub of activity, hosting the lion’s share of restaurants, bars, office buildings and cultural spaces, even if the city’s retail centre of gravity shifted to the strip malls and big-box outlets along Old Airport Rd. more than a decade ago. It’s the kind of downtown — small, compact and centred along a main street (Franklin Ave.) — that if you grew up here, you’d remember fondly, as the site of carnivals and mom-and-pop businesses. Now it seems more like a stand of government buildings that empties out when the work day ends. And certainly no one would call it beautiful. Besides the Legislative Assembly, the Prince of Wales Northern Heritage Centre and the Greenstone Building, there are few pieces of architecture that rise above utilitarian at best; downtown buildings, on a whole, have the sturdy air of being built with one main purpose: to withstand winter. That said, there are hints of inspiration. Somba K’e Park is a gorgeously landscaped public space overlooking Frame Lake, arguably the city’s best feature. And there are there are plenty of murals brightening otherwise drab exteriors. Some cities succeed because of their downtown. Yellowknife succeeds in spite of it. But it’s still the place you want to live if you’re young, urbane, or simply prefer a more compact and walkable lifestyle. And things are looking up. Several ambitious new restaurants and cafes are bringing style and quality to the area. Efforts are being made to use public space for markets and festivals. And with the launch of an initiative — underfunded and snail-paced as it is — to provide housing for Yellowknife’s most vulnerable population, some headway will hopefully be made to alleviate the racialized poverty that is, unfortunately, the hallmark of downtown today. Downtown sprung up after WWII as a pet project for the federal government. Yellowknife hadn’t yet been declared the capital of the NWT, but the mines were humming once again after a war-time lull and the population was on the up, crowding out the area now known as Old Town. The ground between Frame Lake and the hill down to School Draw is a sandy plain, which meant easy digging for water and sewer lines. With some forward thinking, government planners could introduce a grid-like rationale to the town, notably lacking from the community at the bottom of hill. Surveying was done in 1945. By the end of the decade there was a hospital, a school, a hotel, and residential neighbourhoods arrayed along the neatly ordered streets. The first town hall came in 1955; the Gold Range opened in 1958. 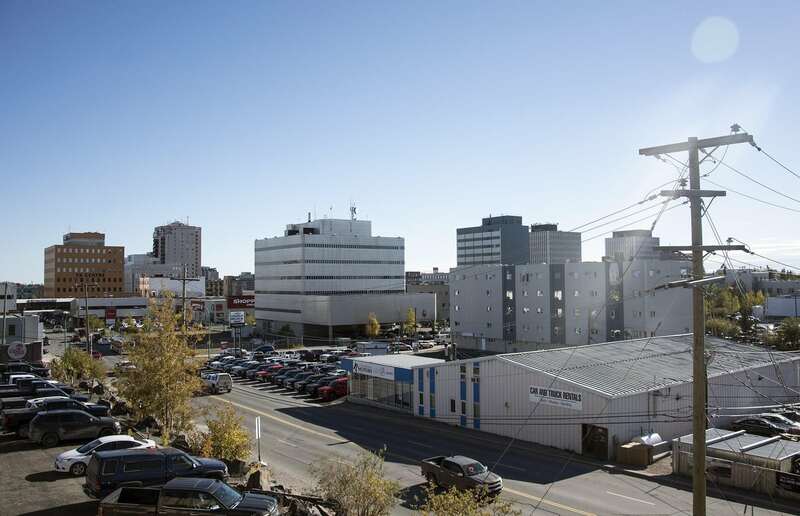 The surge in building that gave downtown its current shape began after Yellowknife became the territorial capital in 1967. In came the bureaucrats, all needing places to live and work. The 14-storey Coast Fraser Tower, the city’s first high rise, was built in 1970 to house government employees. The first government office tower, the Bellanca Building, was built in 1973, and the Explorer Hotel was completed a few blocks away in 1976. Slowly the neighbourhoods that had been built in the late ‘40s and ‘50s were knocked down to make way for office towers and parking lots. By the early ‘90s, the wave of development was cresting: Centre Square Mall with its 17-storey Northern Heights building was built in 1992, expanding downtown’s retail capacity at the same time those big-box stores began appearing along Old Airport Rd. The decades since have seen downtown’s livelihood ebb and flow with the territory’s changing economy — the closure of the gold mines, the boom in diamond mining, the interest and then disinterest in oil further north. Because Yellowknife made a successful transition (for better or for worse) from industrial town to government city, downtown, with its concentration of government employees, has been able to ride out these changes with relative ease — even while the city’s residential and retail centres of gravity drifted south of Frame Lake. As the hub of Yellowknife’s transportation spoke, downtown is Yellowknife’s most accessible neighbourhood. All three bus routes come downtown, with routes A and B travelling along Franklin Ave and Route C intersecting Franklin Ave. on 48 St. There are, of course, perennial complaints about parking space. But City Hall has spent the past two years installing hundreds of new on-street parking spots, if you’re willing to dish out the change. For people who live downtown, or even on the outskirts, pretty much everything you need — schools, grocery stores, restaurants — is within walking distance. Although downtown businesses now compete with the likes of Walmart, Canadian Tire and Staples on Old Airport Rd., the area remains the focus for food, entertainment, and high end shopping. The majority of Yellowknife’s restaurants and bars are located downtown, and with the opening of Korea House, The Fat Fox, Birchwood Coffee Ko and Elke’s Table in the last year, the variety of offerings have expanded considerably. The area is home to Yellowknife’s nightlife, with the Gold Range and the Raven as your go-to places to dance, and a half dozen other locations to grab a beer after work. For your more quotidian needs, there are two drug stores, Glenn’s Independent Grocers and a liquor store. And while you’re not going to be doing too much window shopping downtown, there are a number of high-end clothing, sports gear and furniture stores in the area. The west side of downtown butts onto Frame Lake and its scenic 5 km trail, perfect for jogging, hiking and mountain biking. On the opposite side of downtown is the Tin Can Hill trail system— a favourite for dog walkers and skiable in the winter. There are two gyms in the area, Breakaway Fitness and Just Fitness, and the The Racquet Club, with its gym and squash courts, is at the bottom of the hill to Old Town. There are also two yoga studios: Taiga Yoga and Collective Soul Space. For artistic entertainment, the Northern Arts and Cultural Centre, known mostly as NACC, is located in Sir John Franklin High School. It puts on a mostly excellent, if pricey, yearlong program of dance, music and theatre, featuring both Northern talent and groups from down south. The three-screen movie theatre, the Capitol Theatre, is located in the Precambrian Building on 52 St. and brings in new films every week or two. Both of Yellowknife’s high schools, the Catholic École St. Patrick High School and public École Sir John Franklin, are located downtown. There are also several elementary schools: Mildred Hall Elementary (public K-8), Weledeh (Catholic K-7), and on the outskirts of downtown, the French-immersion J.H. Sissons School (public K-5). Yellowknife Montessori School, which offers preschool for children ages two-and-half to five, is located downtown on 52 St.